Curly Russell, bass; Max Roach, drums. There is, in most every major music center throughout the land, a relatively small handful of creators known as "musician's musicians," one to whom, whenever they have the opportunity, the majority of better known Jazz artists go out of their way to listen to or jam with. Chicago, in particular, has been able to produce quite a few of this rare type of musician. The late drummer, Ike Day, was one to whom all the major jazz percussionists of today, including ours for this date, Max Roach, would sit and intensively listen. Another is bassist, Wilbur Ware, of whom Thelonious Monk is particularly fond. Ex-Hines/Eckstine trumpeter, Gail Brockman, and the late guitarist, Ronnie Singer, are two others. 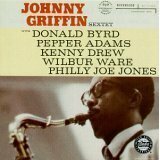 Among saxophonists, Johnny Griffin, by many, is considered to be "the man!" 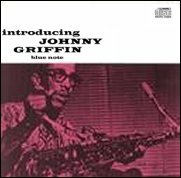 Among his personal preferences and influences, Johnny lists Byas, Bean, Bird, Bud, Pres, Fats (Navarro), Dizzy, and Dex, with special bows to Thelonious Monk. Johnny's two week stay with Monk, at the Bee-Hive in Chicago recently, was one of the Hive's all-time musical highlights in its ten-year history of presenting jazz. On side one, Johnny leads off with an original, "Mil Dew," [mp3] an up tempo "rhythm-type" thing wich takes off like a rocket from Max's into, and maintains itself steadily thoughout Johnny's choruses, with Wynton and Curly really keeping things moving right into Max's dynamic fours with Johnny and on into the final out-chorus. The next number, "Chicago Calling," is a light, airy little ditty composed by Johnny, which gives a feeling and mood not unlike the pretty Gigi Gryce tune "Social Call." This particular rendition points out the many fine facets of Johnny's playing; his natural buoyancy, complete freedom with the techniques of his horn, and the way his figures, no matter how far out they travel, always come back home and resolve. The lovely standard, and favorite of Modern Jazz musicians, "These Foolish Things," follows. An outstanding Wynton Kelly solo, surrounded by Johnny's really big-toned offerings, provides a perfect contrast; with a truly excellent example of the basics of control necessary for good ballad playing, with the easily discernable evidence that Johnny's seasoning years spent playing all types of dance music is experience of an irreplaceable stature. Closing the side is a beautiful tune usually associated with sad-voiced vocalists. To Johnny, however, the subtle changes involved in "The Boy Next Door" indicated that a swinging bounce treatment might better enhance the original structure of the song. Wynton's pretty intro leads Johnny right into the melody, which, with that singing quality his tone possesses, permits him to really "tell the story." "Nice And Easy," by Johnny, opens side two, and is a blues with just that feeling the title describes; and not unlike that old favorite, "Red Top." Johnny's raucus choruses have the inevitability of a steamroller. The Kelly chorus, followed by one of Curly's few recorded solos, and the way Max brings the whole works back into the closing theme, is a high spot of Modern Jazz making which, when years have elapsed, will still be a natural "gas." 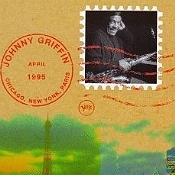 Johnny's rendition of "It's All Right With Me," which follows, is one of the few significant versions, the others being by J.J. Johnson and Kai Winding, and Sonny Rollins. Taken at break-neck tempo, the novely of "Latinizing" the bridge throughout, is carried along by Max behind Wynton's solo. If this particular number were the only good one in the entire album, which, of course, it isn't, I suspect all of the young tenor-men in the country would cop this LP for it alone. Ever since Sarah and Bird recorded "Lover Man," it has been a favorite not only of mine, but of most every Modern Jazz fan and musician. It's one of Johnny's also, and he treats it with a strident tenderness and richness of sound that can do naught but enhance an already beautiful tune. Wynton's not unfunky solo is outstanding, and the way Max and Curly help Johnny bring the proceedings to a lovely end is one of the reasons these two are so sought after for gigs and record dates. For the sceptics of modern listening, who have been claiming otherwise, Max Roach has once again proven that his drumming is not only that of a soloist, but that of the all important pace-setter of the rhythm section. All of the good taste, fire, spark, imagination, dynamics, SWING, and technique which NO other drummer possesses to his -nth degree, is so readily heard that no further comment is necessary. 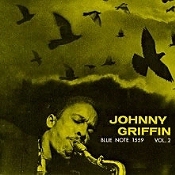 The release of this, the first Johnny Griffin LP, proves many things. Mainly, of course, that here is a young, talented tenor saxophonist who, for too long, has been taken for granted, and who will, no doubt, soon be reaping some of his past due rewards.